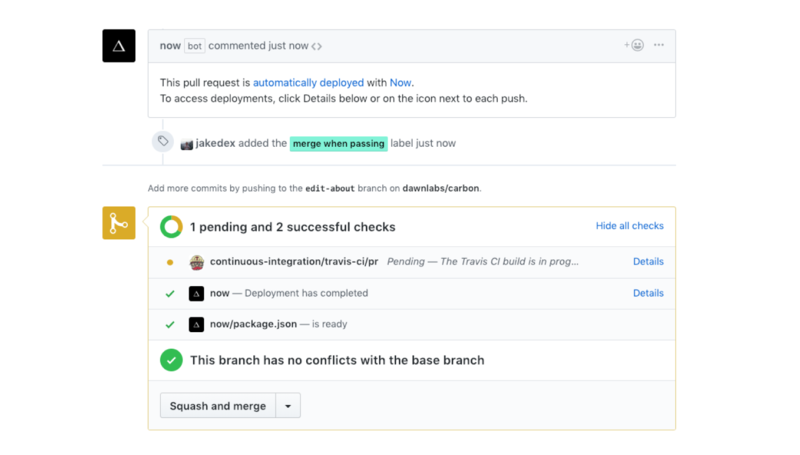 Ranger provides maintainers a set of fire-and-forget tools to help make common tasks simple, friendly, and consistent. 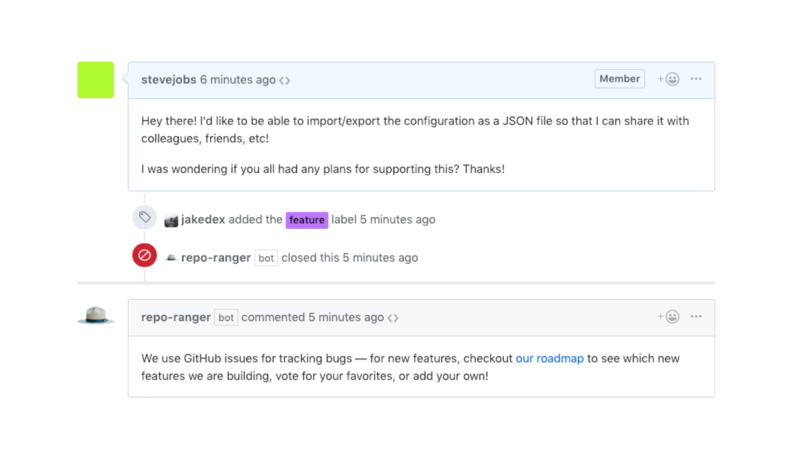 Simply apply labels to close issues, merge pull requests, or create standard comments automatically. All configurable through a simple YAML file. Stop checking if tests have passed and guessing when your build will finish. Just add the appropriate label and Ranger will know when to merge your pull request. Instead of slamming an issue “closed”, give potential contributors a chance to speak up before closing. 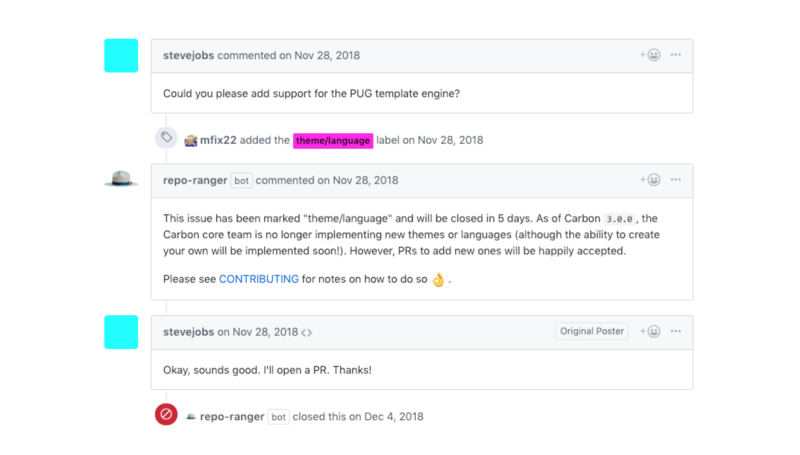 Ranger let’s you apply a label to mark an issue for closure with a configurable delay as well as a custom comment to explain why an issue is being closed. Leave robotic comments to the bots. Ranger let’s you quickly send preconfigured responses while being explicit about the fact that they’re standardized. From deleting unwanted comments to creating tags, Ranger can help in many other ways too! All actions are fully customizable, so you can extend Ranger to enhance any workflow. Check out the docs to see a full list of Ranger’s capabilities. Have a feature idea or repetitive task that should be added to Ranger’s defaults? Ranger is currently in beta and still learning how it can be most helpful. While in beta, Ranger will be free for all public repositories, for individuals and organizations. 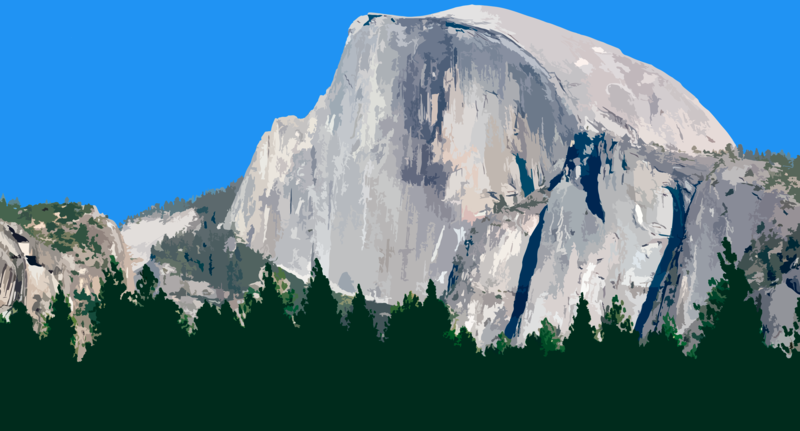 Additionally, Ranger will always be free for open-source individuals and not-for-profit communities. If you would like to test Ranger in your private repos and organization accounts while in beta, please contact us. Need help building a tool or site like this one? Let’s chat!